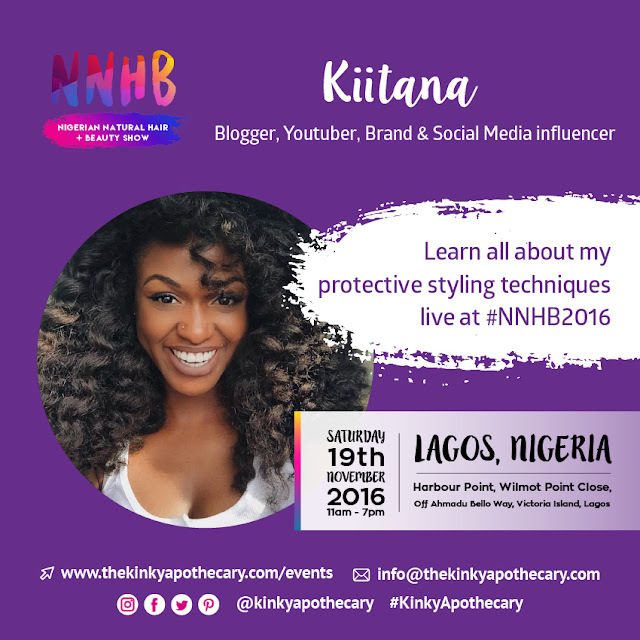 Blogger, Youtuber, Brand and Social Media influencer Kiitana is a protective styling don! She'll be doing a very hands on protective styling and crochet braid workshop. Her inspiration for styling and doing her own hair came as a college student when paying for a hairstylist was way out of her budget. With her new found passion and youtube, she learned a lot of techniques that she uses to date. At University, she had aspirations to apply to medical school but she soon began to realize that her her passion lay elsewhere. After graduating in 2012 with her degree in Biology, she began to realize that her interests in fashion, hair and beauty were more than just a hobby, but rather a calling. That realization empowered her to step away from the medical track and realize her potential. She started her youtube channel (Kiitanaxo) in January 2015 after being asked how she did her ever so changing hairstyles. Little did she know that she would enter the world of protective styling and never look back. As her followers grew, she decided to launch a line of Handmade crochet wigs called HairbyKiitana. This, together with her blog kiitana.com and youtube channel form the lifestyle brand known as Kiitana. Her mission is to help every girl achieve any look she desires. As it did for her, Kiitan seeks to empower women to try new things, dare to be different and express themselves through their hair, clothes and make up. No color is too bright, no outfit too loud and no hair too big for Kiitan to try. She believes in taking risks and being confident in who you are.